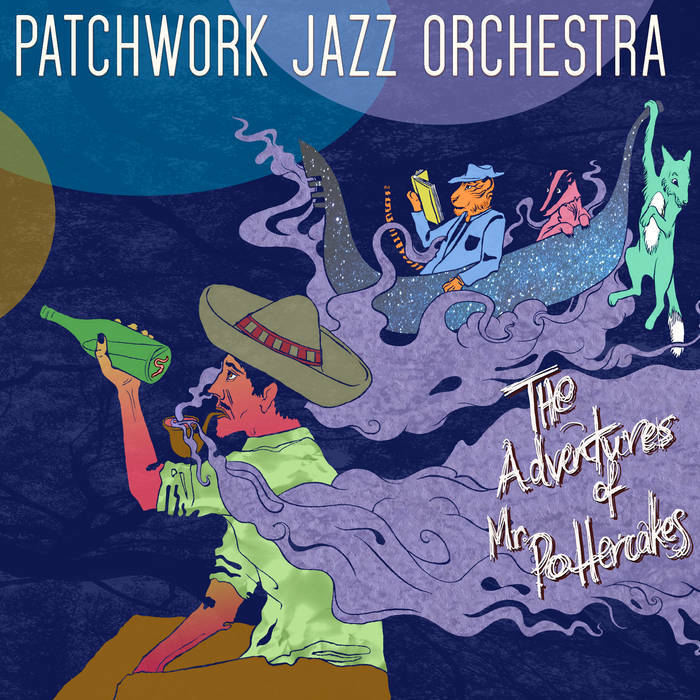 Patchwork Jazz Orchestra's debut album The Adventures of Mr Pottercakes has the name and cover of a children's story, but the depth of a David Foster-Wallace. A group who have embraced the 'millenial' tagline, this is big band music poured from the minds of many to produce a diverse, playful and promising record. The Boy Roy pairs a James Davison composition with a Misha Mullov-Abbado opening moment, a range-stretching bass sets a pensive tone before the rest of PJO steam in with a booming, swaggering arrival. A careful languid Gershwin-esque arrangement, building into climatic moments – at times you'd be forgiven for expecting the band to get up and start slow kicking in unison. Featuring atmospheric trombone and tenor solos, Rob Luft's neat, clean guitar contributions do much to quietly complement the atmosphere throughout. Out of the staged fuzz of orchestral ambient noise and fidgeting surfaces a snapping drum line and delicate bass emerge in Mind Palace before being swept under in treacle horn chords. A sensitive woodwind and flute mix tops the band, before the drums of Scott Chapman again wrestle control and begin to drive. Liam Dunachie is given a calm pause in the limelight, his keys improvisation a neat pick as the group slims down to a core rhythm trio, but this is a storming piece. This is rich music to set a scene. Much of the album is an exercise in narrating a complete story in a condensed song – the constantly shifting eponymous The Advenutres of Mr Pottercakes – or a brace of briefer moments back-to-back in a tender, epic re-spin of Short Cuts, The Complete Short Stories. Hi Wriggly! is a multi-mood thing, the orchestra deftly flipping pace, style and size as they follow on from solo horn moments to join together, at times almost as Mingus' The Clown, albeit slightly more structured. The star of the show is the excitable Badger Cam. Arriving with a roaring rising horn chorus, this is pure crime thriller; dripping in suspense and chase and spawned from the compositional boffin box of Tom Green. A moment of cool guitar edge, some hammond squeals and light-metered racing drums provide respite in the incessant layered horn lines, a saucy baritone solo from Tom Smith some intrigue before we're again swept away. Part of the beauty of Badge Cam, and indeed the PJO approach, is its arrival paired with its own lovingly-put-together video. The piece is brought to life with six minutes of sped up and spliced covert surveillance of busy badgers, foxes and occasional other wildlife cameos. Honestly, the Badger Cam video by itself is one of the best things of 2019 so far. And while I'd implore PJO to bring a collection of curious badgers doped up on badger speed along to the album launch, this is at least crying out for a projector behind the band to showcase this Oscar-worthy work. In true Digital Native style, the album launch itself comes with a promo video, suitably quirky and awkwardly charming to match the fashion-crime shirt persona of the group. And even if the comedy production doesn't hit the heights of other young jazzer, animal-headed features (Nubiyan Twists' Headhunter video in and around Victoria Park is still a winner in this admittedly niche category) the ingenious use of cardboard boxes throughout must be applauded. A core group cut their teeth together at their university big band, before gathering a troupe from the Royal Academy, Guildhall and NYJO. But what the videos demonstrate is that Patchwork Jazz Orchestra are a big band with a friendly small-group vibe. For such a sizeable group, conveying this is an achievement, particularly when the members are all high-flyers taking time out from a range of other successful projects. With particularly well-decorated musicians like Mullov-Abbado, Kieran McLeod, Alex Hitchcock, and Rob Luft, we have to hope that Tom Green (wearing his Spark! record label hat) can keep everyone engaged and interested and rolling along with PJO, too.